Call for a relationship 911 emergency rescue when you really need time alone for just the two of you. Rescue your loved one from the daily routine. Day after day busyness can cause distance and isolation in even the best relationships. Make the short time the two of you share before going to bed more meaningful than a night in front of the TV. 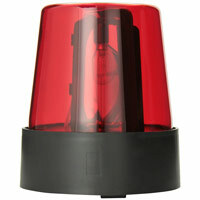 For the best effect, use a Red Beacon Light as shown below like a police siren. If you own a laptop or smart-phone, use the video below to create the flashing light theme. The siren sound isn't needed as, even at low volume, that sound can become very annoying in the background over and over again. 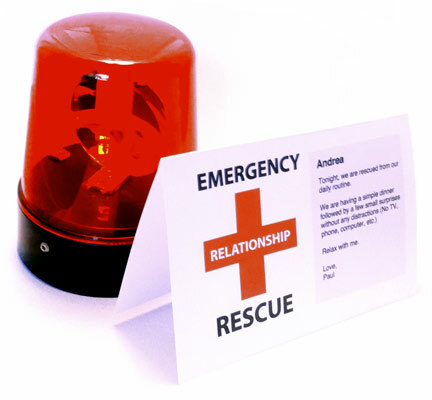 Turn on the flashing red light as a signal that your relationship is in need of an emergency rescue. Place it in an area your loved one will see when coming home from work. Ask her/him to call you on the way home because you have something special planned for the night. You may also replace the regular bulb in your hallway or foyer with an inexpensive red light bulb that can be found in most hardware stores. Add a note for your loved one to see walking through the front door that explains your plans for the evening. Use the personalized note below or just write on a piece of paper and tape it to the front door. Make extra time for later in the evening by getting things done early. Plan ahead to eat a simple dinner and use paper plates so you don't worry about dishes. Turn off the phone, the TV, and anything else that could cause interruption. If you have small children, consider making babysitter arrangements or wait until bedtime. Use that time to relax, give a massage, share your thoughts, sit and talk, play a game, have fun, snuggle on the couch, romance, or anything else to come together as a couple. Alternatively, surprise your loved one with a night out during the week. Whenever your relationship needs another emergency rescue, use this romantic idea as an unspoken signal between you both. Spinning and flashing red light to create the "emergency" mood. Includes power cord. Use this looped video in full screen by clicking the bottom right icon.